John George Somerville (died 1953, aged 82) – Temple Lodge, No.33, Duncan, B.C. John George Somerville (died 1953, aged 82) was a member of St. Servanus Lodge, No. 771, Alva, Scotland who affiliated with Temple Lodge, No.33 in 1916. He demitted from Temple Lodge, No.33 in 1928. He is probably best remembered in Duncan as the contractor who built Duncan Elementary School in 1913. Duncan Elementary School is now a Heritage Building but is still being used as school board offices. Duncan Elementary School, built in 1913. The architect who designed it, the School Board chairman who commissioned it and the contractor who built it were all Freemasons. “Somerville – Many in Cowichan will recall with gratitude the memory of John George Somerville, who died at the Veterans’ Hospital, Victoria, on Friday. He was born at Kincardine on Forth, Scotland, nearly 83 years ago, and educated there. His bent was toward [illegible] and engineering. Going to London, he served the department of works for 10 years, finally having maintenance charge of Westminster Abbey and the Royal Mint. 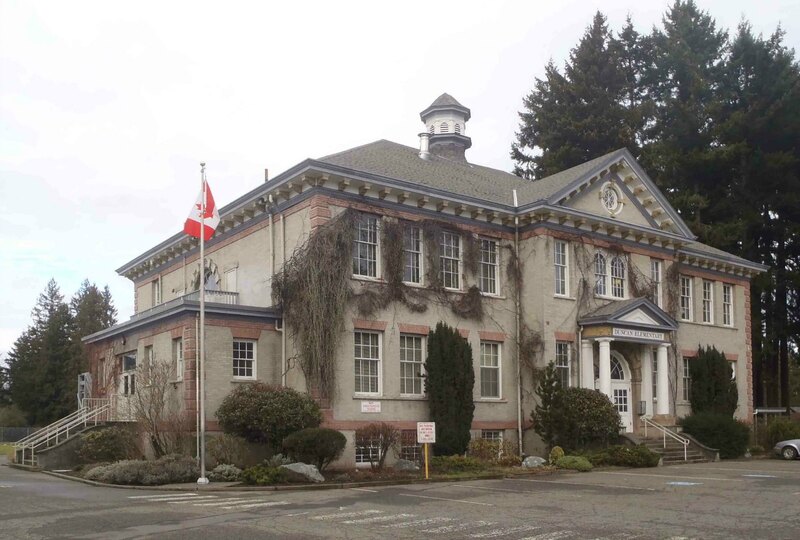 He emigrated to Canada in 1907 and became a building contractor in Duncan. Three years later he was married to Miss Mary Walters, an old school friend, who came out from Scotland. She died in Nanaimo in 1938. Their only child, Mary, is Mrs. Leo Silcox, Edmonton. There are three grandchildren, and two sisters in Scotland. He was a second cousin of Admiral the Viscount Cunningham, of Hyndhope and his brother, General Sir Alan Gordon Cunningham. Mr. Somerville enlisted in the C.A.M.C. in 1917, joined the Canadian General Hospital in France in February 1918 and was demobilized in May 1919. With the introduction of manual training in Duncan schools, Mr. Somerville became instructor for some years before moving to a similar post in Nanaimo. He retired to Victoria after his wife’s death, residing at the Pacific Club. Here he was keenly interested in golf and other sports. He was for some years secretary of Temple Lodge, No. 33, A.F. & A.M. He was for long a welcome contributor to The Leader. Under the nom-de- plume of “Spinner,” his verse will be recalled by many. It deserves a better fate than burial in the files.